The Peek a Boo peeps cupcakes are so delicious and easy to make with your kids. You will require to purchase a pastry bag with a large star tip to make the green icing, decorative flowers, and the Easter marshmallow peeps like bunnies or chicks. Put sugar , cake flour, baking powder, baking soda, and salt in a mixing bowl. Beat with an electric mixer for about 1 1/2 minutes. Mix well. Scoop in the butter mixing on medium to low speed for about 2 minutes. The batter will have an appearance of small crumble pieces. Whisk the eggs, yogurt and vanilla together until the texture is smooth. Pour the liquid mixture in with the dry ingredients beating until combined on medium. Spoon the batter into the lined cupcake tins until 2/3 filled. Bake on 350 degrees for 18-20 minutes or until an inserted toothpick comes out clean. Take out of oven allowing the cupcakes to remain in the cupcake pan to cool for several minutes. Transfer the cupcakes to a wire rack until totally cool. Once completely cooled, use a small spoon and dig a hole in the center of the cupcake. Add more powder sugar 1/2 cup at a time and mix well. Add several drops of the green gel food colouring. Mix well to incorporate the colour thorough out the frosting. Frost around the hole in the center of the cupcake. Stick the candy peep into the hole with the head sticks out of the frosted cupcake. Position several candy flowers on the frosted cupcake. Thanks,i am so making these for the grandkids….adorable !! 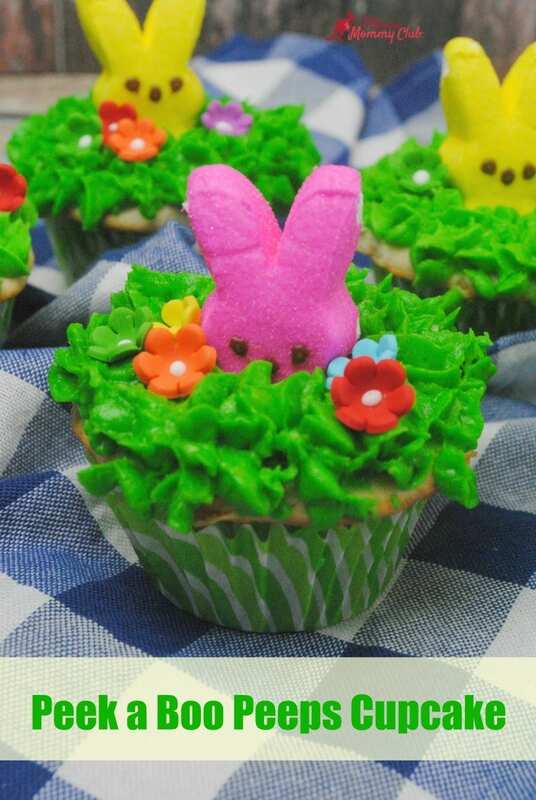 These cupcakes are so cute, and a great way to use the Peeps!! awe these are the cutest cupcakes EVER! my daughter will have so much fun helping mom make these for Easter ! These are absolutely adorable! My girls would love them! These are a great way to combine cupcakes with Easter candy. Any child would love these. These are adorable and look perfect for Easter! I love how you did these cupcakes. They’re really cute and I love the way you did the grass, it must have taken quite a while to get them all done. I can’t wait for Easter to make these for my little grandson!